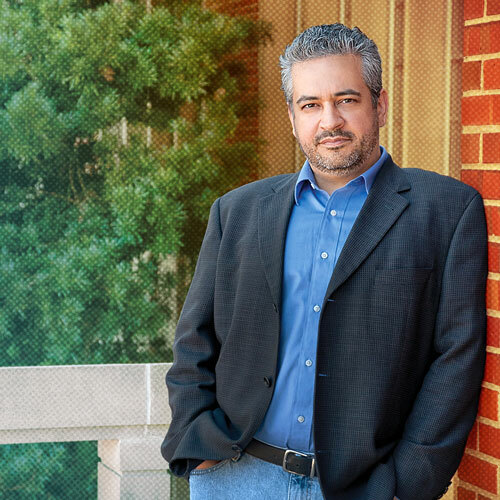 As creative director of The Agency in UF’s College of Journalism and Communications, Jim Harrison guides creative strategy for a team of more than 100 professionals and students with a passion for ideas that resonate with emerging consumers. Built on a foundation of research, The Agency develops inspired and informed work for local, regional and national clients. In addition to his work at The Agency, Harrison is also a faculty member in the College of Journalism and Communications, teaching a course called “Forward Thinking,” and an adjunct instructor for graphic design in the College of the Arts. UF at Work recently visited Harrison at The Agency to talk about design, creativity and ways to cultivate the time and space for both. 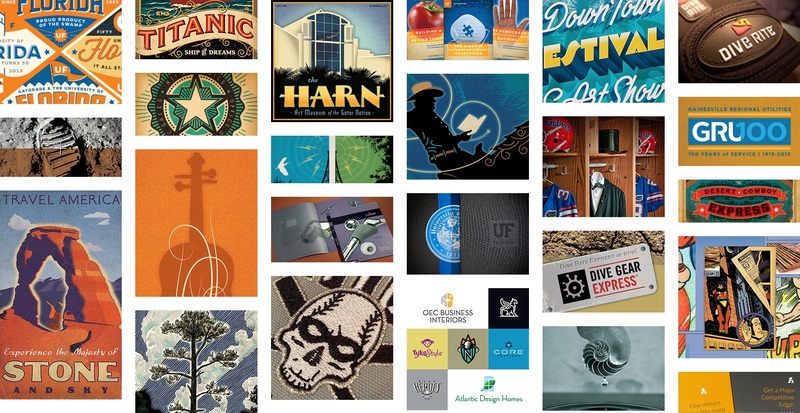 Can you talk about your work here at UF and your background in graphic design and visual art? I’ve lived in Gainesville for more than 30 years and have been a witness to the amazing growth and explosion of creativity that is flourishing in Gainesville. When I graduated college in the ‘90s, most of us were still leaving town to go to the big city, but I decided to stay. I was a military brat, so I wanted to put down my roots here and I made my career about contributing to the creative landscape in Gainesville. I celebrate it, I participate in it and it’s really where my passion lies. My responsibilities at UF started in 2010 when I was hired to work in the Office of University Relations as UF’s first creative director. I helped prepare for the next phase of UF’s brand after the campaign of the early 2000s, which was called “The Foundation for The Gator Nation.” I spent five years plus doing that. A lot of really interesting work was done to prepare for the process for a new brand for the entire institution, and there was a great deal of fun and energy poured into the effort to make that happen. The result of that process was the launch of the “Gator Good” campaign. Do you have any favorite accomplishments from your time there? One that stands out was leading the team that developed the recruiting materials to find President Fuchs when President Machen announced his retirement. 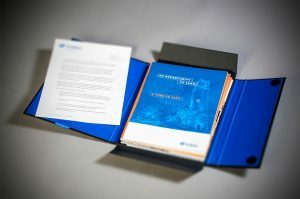 We built this amazing package of onboarding materials that included a job description (the longest one I’ve ever seen), things about Gainesville and the breadth and scope of the university, and a host of digital assets, too. It was such an important job to build the communications strategies around what we put in front of these major candidates to be the next leader of our institution, so I’m very proud of that. The other thing that was really fun to work on was the 50th anniversary to celebrate Gatorade. When did you take on your current role? In 2016, there was a national search for the first creative director at The Agency in the College of Journalism and Communications [CJC]. I was ready to take on a new challenge and explore what it was like to build larger, broader campaigns across a diverse setup of accounts. (Back then, my only client was UF.) This position allows me the opportunity to work with multiple clients like P&G, McDonald’s and Best Buy, for example, and help them understand how to connect with young people and the Millennial Generation. Now that Millennials are aging out of college, we’re shifting slightly to incorporate not a generational expertise but an expertise in the attitudes and values of young adults, and how they affect consumer behaviors. We’re helping brands stay connected with that age group in a way that allows them to forecast what’s coming next as these newly independent young adults are emerging as consumers who will spend a significant amount of money over their lives. Brands really want to know how to connect and be authentic and what’s meaningful to potential customers. What’s meaningful to a 19-year-old today is going to be critical to a brand in four to five years. So it’s kind of interesting for us to think of ourselves as a laboratory for what’s coming next. What does this laboratory look like? How do you get students and brand representatives collaborating? CJC has deep networks and contacts along significant markets, including big national brands, which helps us get in front of people and pitch business. The team that works here are the students themselves; they’re being immersed in a strategic communications agency, which is how we describe ourselves, and that model is very similar to a teaching hospital. That means that, as opposed to a normal advertising agency that may have a client interested in targeting young adults and so a few young adults are brought in, every team member here is part of the target audience. That’s an incredible value for our clients and our students who are having real immersive interactions and doing real work for real clients. What we say is that we are led by professionals, staffed by students and inspired by our faculty. So The Agency also serves as a pipeline to the industry and future careers for students. We’re the only agency that wants you to hire us twice: Once to work with us and once to hire our talent away. We want you to take our talent. We’re building a very real pipeline — we call it the “100 Project” and it involves placing as many of our amazing students in amazing positions as possible. Our placement rate has averaged about 90 percent. It’s been a great opportunity for us to showcase our talent as we develop it. Some of the biggest names in our industries for advertising and public relations have agency alumni now who are leaping into their careers. The Agency is a great place where students can begin to understand how theories in the classroom transform into practice. And we’re vested in working with our faculty to reverse that flow — allowing The Agency to reflect changes in the advertising and PR industries that can inform what’s taught in our classrooms. Switching gears a little, how did you first become interested in art and creativity? Like a great many stories, it had to do with unrequited love. I had a relationship in my teens that forced me to take some focus on other things and one of the things I found was art. At the time, I was at Buchholz High School — the AP art program was amongst the best in the state — and I had a very good instructor by the name of Julie Felts. Before long, I ended up getting one of the last full-ride, fully paid art scholarships at Santa Fe before those antiques went away. I even got a stipend for art supplies. I eventually transferred over to the graphic design program at UF, which I graduated from and where I teach as an adjunct. I’m very proud that they have asked me to work with their students. I had been running my studio, which is called MetaVisual, all by myself and the first week of class I thought, you know, being around other people isn’t a bad thing. Suddenly, I was able to translate working on projects by myself into working with 18 different people on their projects. That was in the late ‘90s/early 2000s, and it was a great creative leadership opportunity. When the offer came to join UF in 2010, it made a lot of sense to go ahead and spin my studio down and come here to work as a creative and still teach, which eventually led to my role here. Can you talk about the course you currently teach at UF? I teach a course called “Forward Thinking” in the CJC, which is based the principles of how creativity works. It’s all about thinking creatively, not producing visual communications the way a traditional graphic design course would do, and that’s a big change in our industry. There’s the nature of visual communications (i.e. graphic design), the nature of strategic communications, which is what the CJC does here, and then there’s this thing called design thinking, which has become really huge. Design thinking is applying problem-solving methodologies that traditional graphic designers have learned and elevating them to be more strategic in solving larger problems in a business and commercial context. So a lot of my current work involves creativity as it applies to design thinking, systems thinking and systems design. Since we think and solve problems in that way, a lot of designers naturally matriculate into roles where we’re advising marketing and experience design. It’s not enough now to design a nice logo and a great brochure because someone who sees a logo or takes a brochure has to come and set foot on this campus. How they interact with us and how we interact with them — how we guide them across campus in everything from wayfinding and systems of websites up to and including the built environment on campus — it’s all designed very carefully to make sure we have positive takeaways from the millions of visitors that we get every year. I’m very excited by the opportunity to contribute to those conversations on campus. Can you talk about the importance of diversity when it comes to creativity? Designers tend to see diversity not only in traditional terms like diversity of culture, background, race or sexual orientation, for example, but also in terms of diversity of experience and perspective. One of the impactful things designers learn is setting aside your own ego and connecting with someone else’s perspective. It’s a revelation for a young designer to recognize that the work ultimately was better than they could ever have made it by themselves, as one person. That is when you truly start to value on a fundamental level what it means to build diverse teams, interact with other people and be open-minded, and share ideas, rather than to try to own ideas. When we try to own our own ideas and force them on other people, collaboration and communication become strained and tend to break down. Good creative leaders fundamentally understand that their primary job is to cultivate an atmosphere where collaboration, trust and openness allow that diversity to impact the work positively and make it possible to discover new, better and improved ideas. Can you talk about some of the exciting projects you’re working on? One of the things I’m proud to be building is something I’m working on with UFHR. Training & Organizational Development Assistant Director Scott Blades has asked myself and Amy Bucciarelli from Arts in Medicine to build a new professional development academy, along the lines of the Strategic Communications Academy that Ann Christiano and her team run, called the Academy for Strategic Creativity. The goal is to take the creative process, which is very hard to wrap your head around especially if you don’t consider yourself creative, and align it with strategic processes. Learning how to leverage the way creativity works can help us be better communicators — in everything from figuring out new processes or new ways to communicate to designing better experiences. We’re terribly thrilled that there’s been so much interest in the program. It will be a six-month, one-session-per-month development track, and we’ll engage in a lot of learning and a project where you can try to solve some of your unit’s thorny, sticky problems. Can you explain how creativity works? I’ll start with something I call a heresy, and this one in particular usually makes people sit up. Creativity is not a talent. This is very much a nurture over nature issue. Creativity is a way of seeing the world differently and when you see and experience the world differently, your brain is being prepped with raw material that it needs to find new connections between things and to cultivate mindsets that allow those connections to rise to the surface. It involves understanding how we perceive the world. It involves understanding how the subconscious works because the subconscious is very very active in creativity. The subconscious for creativity is almost like your employee. You say to it: “I need you to work on a project. I’m going to give you what you need and then you’re going to go and do it. I’m not going to be thinking about it. You’re going to be working on it, and someday you’re going to bust through the door and give me the solution and it’ll be at a moment that I least expect it.” I’ll be in the shower. I’ll be driving down the road in a car, and I’ll have a revelation. And that’s the subconscious doing the hard work for you. Anyone who is creative has cultivated a life and a way of seeing the world that’s different; it’s more mindful and more aware. I call it meticulous curiosity. Creative people maintain at all times a curiousness about the world around them that leads them to explore or investigate and learn about the world. What are some of the other heresies you talk about? Another is that brainstorming is often a waste of time. It often fails because people are put on the spot and it assumes that people are going to come with a full enough understanding of the problem to start throwing out solutions, when in fact nine times out of 10, the people participating in a brainstorm need two or three times more information than they currently have to dig at an insight — and it’s truly going to be an insight that drives a creative solution. So a lot of people now are starting to change the way that they brainstorm, and in fact, there’s a word now called “framestorming,” where you participate in a meeting and only questions can be asked. It’s very easy to say I have a surface-level issue that I need your creative solution for when in fact the solution really needs to be applied five levels deep so that everything else gets better and not just that one problem. It’s like treating the symptom instead of the disease. Brainstorming often feels messy, less productive than we thought and disappointing for that exact reason. The third heresy is that the “Big Idea” needs to die. When people who aren’t versed in strategic creative problem-solving say I need a big idea, what they’re actually doing is introducing a bias for size that often comes at the expense of impact. If you prioritize the reach of something, you often lose sight of the real goal, which is to say, but did you love it? Did it move you to act? And you see it all the time. You see things that flame out at a big level. It’s when people feel like they can participate and contribute to something that something really grows and sticks — making you realize very often these repeated requests for big ideas are far too general. Heresy four is that procrastinating can be productive. There is something in the subconscious contribution to solving creative problems that requires us at a fundamental level at some point to allow something called incubation to happen. When I’m working hardest, I look like I’m working the least. I’m staring up into the sky, I’ve got my feet up on the desk, twiddling my thumbs, and my brain is somewhere else. I’m not allowing the pressure of the now to influence the time that I really need to arrive at a great idea or to refine an idea properly. I often say if you give me two days, I can save two weeks. In a busy world, how do you create the space needed to foster that incubation period? I work in a world of deadlines and when I take on a client, I make sure I’m budgeting a fair amount of time for development and that includes this principle of serendipity. Respecting the serendipitous nature of creativity means being open-minded and not letting your ego lock onto something and fall in love with it, because in that moment of the process, you’re shutting out other opportunities to make it better down the road. What does creativity look like in your daily life? Do you have any tips? There are habits and behaviors you can put forth in your daily life, whether you’re an engineer, a writer, a graphic designer, a marketer or a chemist. First, you must engage in childlike play. John Cleese, a comedian and member of Monty Python, says that you must create for yourself an oasis of play where the demands are zero and the opportunities are infinite. And you must be in that space for as long as it takes to feel comfortable about some of the ideas that you’ve started to formulate in your mind. There are so many things that young people do when they play that adults forget how to do. The creative process is actually alternating between a childlike mindset and an adult mindset; we broaden our ideas in a childlike way and then, as adults, we come back and refine the 40 ideas we had into the four that are really strong. And then we take those four and we play with them and find ways to make them exciting and broad, and then we put our adult hats back on and take those broad ideas and get them strategically aligned and focused. Freshness is another great tip and involves stocking that kitchen pantry of your mind with as many experiences as possible. There are two different kinds of freshness — one is ongoing freshness, like taking a different route to work or reading a different magazine in the doctor’s office than I normally read. And then there’s deliberate freshness, which is this idea that changing your environment changes your mindset. So, for example, today we’re not going to have the meeting in the conference room; we’re going to go get coffee and we’re going to sit outside. Do you ever get in a creative rut? Of course. It’s not a superpower that when once you learn it, it always works for you. You reach points where either you’re a little bit stifled or maybe you’ve repeated yourself a little bit too much and you recognize that you need to break out of it. That’s where diversity really comes in; if you cultivate a diverse group of people from diverse backgrounds and perspectives, you can really do some amazing things. Did you make any new year’s resolutions this year? I always try to make sure I carve out some time for myself to have a few passion projects. I’m currently searching for what might be next. It’s got to be fun. At the end of the day, I’ll always be a maker of some sort, a producer of things, and that’s one of the scenarios professionally in which I’m happiest. I do love mentoring and I love being involved in my students’ development — I get a great deal of satisfaction from that — but there are times when I feel like there’s an imbalance and usually it’s because I’m not making enough. If I find I’m too busy administrating or teaching or one thing or the other, I have to remind myself to make more things.